The band can trace its origins back to 1881 when it was known as the Leatherhead Town Band.Activities ceased during the first world war and the advent of war in 1939 meant that the instruments had to be mothballed. Unfortunately many were never recovered. 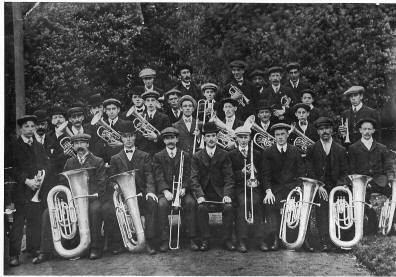 In 1947 the band was reformed and became known as the Bookham and District Silver Band. The founder members remained for over 20 years. The band was renamed the Mole Valley Silver Band in 1974 to reflect the wider local authority area which came into being at the time. The band has players of all ages which it draws from both within and outside the Mole Valley district. Members come from all walks of life including teachers, engineers, policemen and schoolchildren. New members are always welcome please contact us if you are interested in joining.